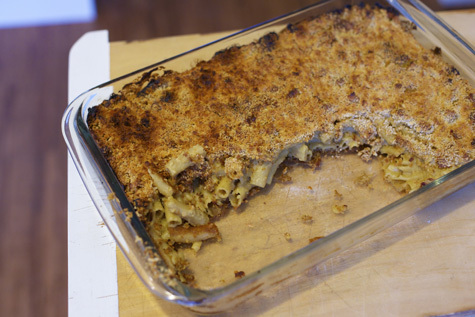 Recipe: Because The Internet Needs More Vegan Mac ‘N Cheeze . . .
Yeah, they’re everywhere: here here here here and here, and that’s just the tip of the iceberg (cheezeberg?) But I had to add my own interpretation! After having such success at cracking the Alfredo code, it seemed liked the next logical step. Chop the taters and place in a small pot, covering with water. Boil until tender, 15-20 minutes. In the meantime, cook pasta according to directions, but leave it a little al dente. While pasta and taters are cooking dice your onion. Place a pan over medium heat and add the oil. Sauté the onion until glassy, then reduce the heat to low and add the wine. Continue to cook until the wine reduces and the onion has browned (NOT burnt! be careful!) Drain the pasta while the onions cook down, and then set it aside. Place all the ingredients, including the taters and onions, into a food processor or blender. BLEND! Pour the blended sauce over the pasta and toss to coat. [There will be a lot of sauce and you probably won't need it all. That's okay! It stores well and is great as a chip dip, over baked potatoes, served with artichokes, etc] Transfer the saucy pasta to a casserole dish, add a bit more sauce depending on how ‘wet’ you like it, and cover with bread crumbs. Bake until browned, about 20-25 minutes. So, everyone seems to have their own version of vegan mac. Do you make one? What’s your secret ingredient? Oh, vegan mac. Finding one that suits your palate is the vegan holy grail! I’ve tweaked out my own version that is very similar to what VD posted, and I often use the VYY recipe (but with about half the EB) when I need to use up carrots and potatoes. My absolute favorite recipe, hands down is one that is still in the testing phase…but the cookbook will be out later this year, so soon everyone will get a crack at it! The best thing about the soon-to-be published recipe is that it’s a dry mix – you just add it to heated non-dairy milk and voila, instant mac! Oh, and I use full fat coconut milk in soooo many recipes. It is definitely an essential ingredient for vegan mac. My top secret ingredient, though, is really good quality smoked paprika. Aha! Coconut milk! I’m not vegan, but I might try this. Coconut milk is so much better for you than dairy. 1) I like your style. 2) I’m always looking for eco-friendly alternative, even though I’m in a town that is not very eco-friendly. and 3) Although I’m not vegan, my father-in-law is and I’m always looking for new recipes to try on him. Any chance of some eco-minded new momma posts coming up? I’m due in July, myself, it is so Exciting!! Question about the yukons: are they cooked before we pop them into the food processor? I made this last night for dinner but I put in my favorite meatless “ground” to add that homey, casserole-y vibe. The cheeze sauce is amazing, thank you again for an excellent dairy alternative. @ windycityvegan – Ooh, a homemade dry mix! Love the idea, please let us know when it’s out! @ Eric Normand – Hope you like it! Coconut milk is diviiiiine. And yes! To my surprise I’m getting tons of requests for baby-related posts. So I’ve got some in the works – stay tuned! CONGRATULATIONS!!! @ April – Whoops! Thanks, I’m editing that now . . .
@ Richard – Haha, yeah nooch can be tough for some people. If you’ve never like a cooked sauce before then I’m afraid this may not be the recipe for you. But, I’m flattered that you’re willing to try it! @ Kelly – Yay! So glad you liked it! Add me to the list of people requesting baby-related posts! Although my daughter is almost three and a half now, there is still such a void out there for any sort of eco-minded parenting information. Hey Sayward-I realize the vegan mac and cheeze post isn’t the most appropriate place to ask this, but I figured you’d get the question regardless of where i post it, no? Anyway, just wondering what you’d recommend as far as a non-chemical “green” sunscreen? I mean I’m all about wearing hats and sunglasses and not exposing a lot of skin during peak hours of sunlight, but at the same time, I’m all about outdoor summertime fun! A bit off topic, but I’ve been watching this blog for a while, and when I found this I thought of you because I remember your mission on second-hand clothes. I don’t know if you’ve seen it before? Either way, it’s pretty amazing. Keep it up! gotta say, Nancy, that is one of the coolest videos about being frugal and recycling! thanks for sharing! 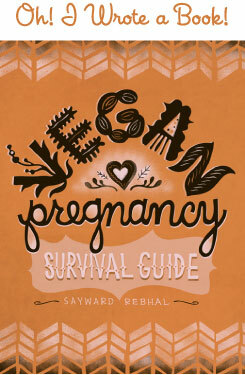 @ windycityvegan – I’ve been surprised how many requests I’ve gotten for the baby-related stuff. But I hear you guys! EcoBaby posts on the way! @ Heather – I saw you asked about sunscreen in the Feedback Forum, so I’ll answer you there. As for the thrift list, alas I didn’t get enough response to make a very substantial list. =( I’ll maybe try again in the future . . .
@ Nancy – I love The Uniform Project but I hadn’t seen that video. How wonderful – she has such keen style sense! Made your vegan mac last night. Fantastic! I’m glad the recipe makes extra sauce, as it is a little labor intensive to mix everything together and it’s nice that we now have enough frozen sauce to make a second batch. I’ve never used Miso before, wasn’t quite sure what to buy. Ended up getting a tub of white Miso paste. Is this what you meant? Thanks again, it was a wonderful dinner. @ Cary M – Yay, so glad you liked it! White miso is perfect, that’s exactly the one I think works best. =) Have fun playing with it – miso is awesome! Just tried this tonight and it was great! Super rich and perfect comfort food for a cold night. Thanks so much!! OMG! I just made this the other night for the family and the kids just LOVED IT! My partner is vegetarian but generally does not like anything that deals with vegan cheese, but he loved it too, and we both ate (what little was) leftover for lunch. This has been on my list of things to make for a while now, tried it with GF quinoa pasta & it is soo good! The coco milk really takes it there, great recipe once again.